Sammy Vaca and Dallas Richard are semi-finalists in the TCEQ competition, and they need the public's help to advance to the finals. AUSTIN, Texas — Sammy Vaca loves Texas so much she made a video to make sure everyone takes care of it. "Everyone loves Texas, here are a couple of tips to take care of the beautiful state we call home" is how it starts. The video stars the 13-year-old Hudson Bend Middle School eighth grader. She wrote it, shot it, edited it and wrote code that animated it. She is now vying to become the Texas Commission on Environmental Quality's best video in the whole state. Sammy Vaca told us about her challenge. "How can you make something catchy that can make someone stay?" she asked. "So that they can actually help the environment and use these tips." Principal Tom Payne called Vaca getting this far tremendous. He said her talents are obvious, which his school's video production and broadcast classes helped shape. "It's really her ability to dedicate herself to what she's passionate about, which is what I love," Payne said. If Vaca wins, "it would be really, really cool," the 13-year-old said. Dallas Richard is also an eighth grader at Hudson Bend Middle School with a video in the semi-finals. He said he wanted to created this video that people would remember. "I thought making it funny was the best way to get the Take Care of Texas message to stick in someone's mind," Richard said. Richard said it was fun to put the story together and direct his friends in the video. He also said he hopes the contest gets people excited to learn more about how to help the environment. As for his chance of winning, the 8th grader said it would be awesome to make it to the finals. "It may be tough but friends and family have been really great helping to get the word out," Richard said. this link and vote in the sixth through the eighth grade category. 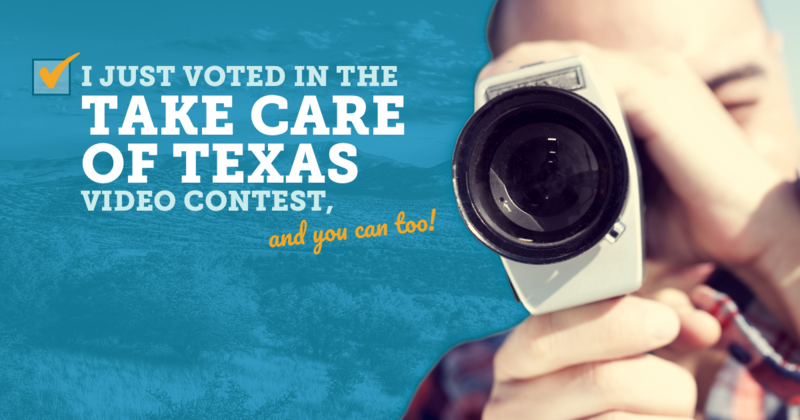 I Just Voted In The Take Care Of Texas Video Contest, And You Can Too! Many Texas students worked hard to produce videos for the Take Care of Texas Video Contest. Out of the many entries we received, we're excited to present these 12, which have made it to the second round of judging. Now it's time for you to pick your favorite videos!